Artificial Intelligence was embraced by businesses and industries alike in 2018 to enhance customer experience, improve business models and generate new innovations. PwC predicts the adoption to soar in 2019 with over 20%, out of the 1000 US organizations surveyed, planning to implement AI enterprise-wide this year. As AI empowers machines to grow beyond performing physical work to carrying out intelligent tasks, it would be ideal to be prepared for the opportunities and challenges the great technological breakthrough puts forth. Helping us on this front is Kirk Borne, Principal Data Scientist at Booz Allen Hamilton, who has also been honored as the #1 Digital Influencer for 2019 by IPFC Online. As a global speaker, he has given hundreds of invited talks worldwide, including conference keynote presentations at dozens of data science, AI and big data analytics events globally. 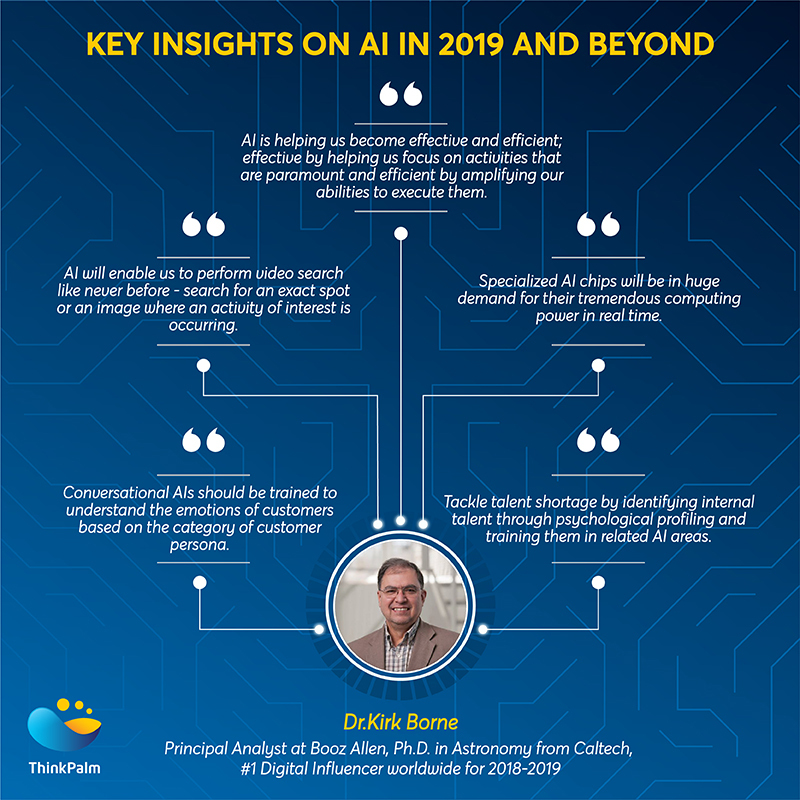 Here’s an excerpt of the telephonic interview we had with him on the state of AI in 2019. AI-enabled technologies are expected to advance in 2019 and beyond. According to you, which AI-enabled technology should we watch out for? I believe computer vision is opening up tremendous possibilities of using AI for facial recognition and to detect objects in a scene, that can be beneficial to the society as well. Object detection in videos where AI can go beyond tagging objects in a video to detecting activities performed by them has come into existence. This enables users to perform search on video like never before – search for an exact spot in a video or search for an image where an activity of interest is occurring. Another use case is the application of AI in disaster response where the rescue team can detect people in distress through their facial expressions and body movements, captured on camera. Even in public events with large crowds, AI can be applied to videos and photos from the event (including those posted on social media) to help detect if a person has a problem through facial and emotion detection. I am also particularly interested in how AI can be applied to search text documents. We can currently search documents by keyword or content but through AI we might be able to infer the context of the document based on the content, even when the specific keywords are absent. I am also looking forward to the possibility of AI helping stakeholders manage the plethora of data encountered everyday by organizing them on the basis of themes and topics, thereby helping them find contents that are absolutely relevant and needed. Everything boils down to AI helping us become effective and efficient; efficient by amplifying our abilities to get things done and effective by helping us focus on things that most necessarily need to be done. While working on AI projects, a difficulty we face is developing predictive models that represent reality perfectly. For example, in my company, we have been trying to design a Convolutional Neural Network for plant leaf disease detection. We got an accuracy of 99 for a set of CNN and pooling layers, but when we added another pooling layer, the accuracy reduced to 98.5. Is there a framework or clear cut approach towards building a perfect model or is it truly experimental? I think it is experimental. Even if we build models with 99.9% accuracy, it is still a model. We should stop trying to over fit the training data – include too many features or complexities in our models which may look perfect on our test set, but not have anything to do with the actual model. As a scientist, I loved when my model stopped working well because the exercise to figure out what was going on in the real world that caused my model to be less accurate, could lead to an interesting discovery! Do you think hardware has a key role to play in AI advancements? Definitely. Graphcore’s Intelligence Processing Unit and Google’s Tensor processing units come with great computing power and power efficiency that will help speed up the execution of AI-enabled applications. Specialized AI chips will have a huge demand in sectors like self-driving cars, where huge data needs to be processed in real time. If we employ traditional computing in such cases, there would be latency – time lag between sending the data to supercomputers for processing and receiving the output, which further delays the execution of key actions like applying brakes upon detecting obstacles. AI in the chip is going to be a big thing in future! How should enterprises go about building their Data Science teams in 2019? Talent shortage is a key concern. Plus there are no unicorns out there. More businesses are realizing that the trick is in utilizing internal resources than hire externally. One thing that my company did was psychological profiling – exploring the employees’ key abilities and aptitude and train them in related AI areas. For example, people who have aptitude for mathematics can be taught ML algorithms, those who have a flair for technology can be trained to become data engineers, those who are great creative visual thinkers can be trained in UI. This way, you save yourself from the laborious recruitment and induction processes, and the risk of hiring the wrong person for the job. In 2019, customer experience will matter more than ever, as per Gartner. How can we make conversational AIs more human-like and intelligent in the coming year in terms of analysing customer’s attitudes and intentions? AI is not intelligent – period. In this short horizon called narrow intelligence, AI can perform activities it has been trained on but not otherwise. When it comes to customer service, you can start describing customer personas for each scenario – customers calling for information, to raise complaints, to return an item and beyond. 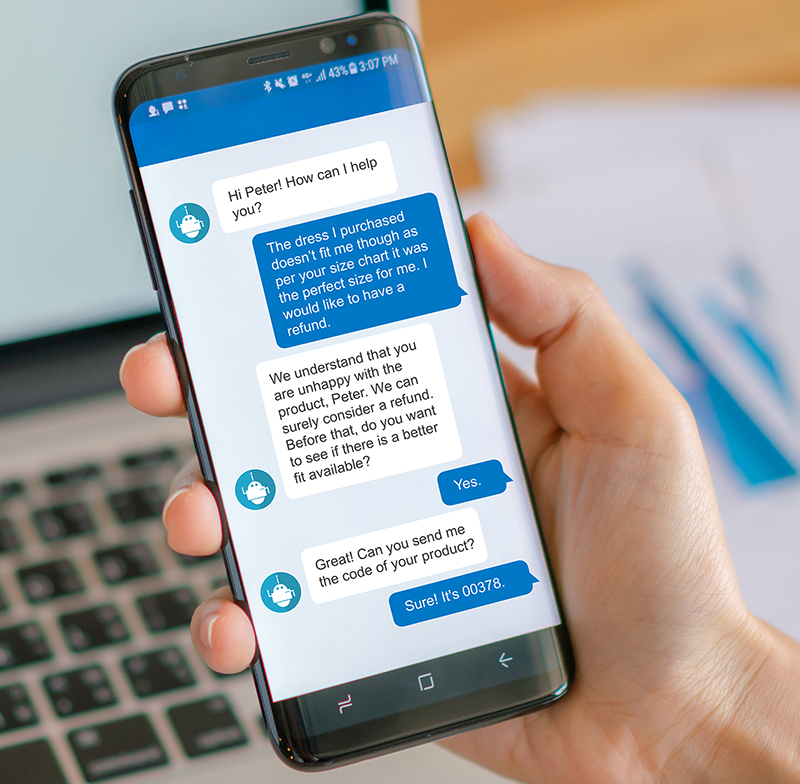 The customer service bot should be trained to detect cues or signals in the voice patterns, emotions or words for each use case. They should be trained to understand and respond to the emotions or sentiments of customers, depending on the category of customer persona. Sentiment analysis and emotion recognition can help – if someone is calling for information, there should be no emotion associated with the conversation but if it is a complaint, it should be capable of detecting emotions in the conversation. Open source resources are being made available today for the development of AI. Is open source the way ahead for AI? I believe it depends on the industry. In healthcare administration, for example, there are specific functions that every administrator has to perform such as fraud detection in claims, data privacy protection of healthcare records and beyond. You can design an AI that can be applied to every single organization in healthcare administration fraud detection. In such industries where vendors with specific AIs have a huge market to deliver to, open source might not be necessary. But in majority of the situations, especially when SMBs are involved, costs for in-house software development become too huge to afford, while open source allows existing solutions to be tailored to the specific use cases of the client, which is a better and more cost-effective approach. For instance, chatbot APIs offered by public cloud providers like Amazon, Microsoft and more can be fed your FAQs as the content to answer repetitive questions without human intervention. Do you see AI and IoT converging at the edge in the near future? Absolute convergence cannot be avoided because we are going to have sensors everywhere right from cars to manufacturing units to wearables. Rather than collecting data at the edge, I would like to think of it as moving intelligence to the edge. Because, like I mentioned before, there would be a delay associated with collecting data through sensors and moving them to the cloud for computation which can be overcome with AI algorithms at the edge. Do you believe AI-enabled robots have the potential to replace humans in all fields? I don’t believe that our world will be described by robots. Jobs will change but humans will prevail in all areas where human intelligence and judgement would count – problem solving, dealing with edge cases, creative and ingenious work and beyond. For instance, authorities are insisting on having assisted driving in autonomous vehicles to avoid mishaps. Like I said earlier, AI is all about improving our efficiency and effectiveness, not about replacing us. Let's Meet Up at MWC!